Cultivation on a coco substrate and hydroponic growing are popular cultivation methods. Every grower has his own preference and every substrate has its own characteristics! Why wouldn’t you combine best of both worlds?! With this in mind Atami has developed Hydro Rokz Cocos 60-40! The substrate is a well-balanced blend of clay pebbles and top quality coco peat. Hydro Rokz Cocos 60-40 offers many benefits of growing hydroponically. The clay pebbles provide excellent drainage as they retain nearly no water! This decreases the risk of over-watering. When the water is drained, fresh air enters the root zone and gives this substrate a high air ratio, for optimal root development! Adding coco increases the water retention of the substrate. Coco offers a buffer between watering times, as makes sure moisture levels near the roots stay stable. And, it holds on to some nutrients as well! High Porosity Cocos (HPC) combines the properties of ATAMI’s Cocos Substrate with perlite for increased substrate airiness. The coco of Atami is known to be very clean and low in detrimental salts, while also containing a balanced fertilizations. To achieve this, the coco is ripened, washed, buffered and lightly fertilized. Perlite is volcanic rock that has been formed during volcanic eruptions. It is treated with a high temperature to make it expand. You can compare it to popcorn. When we heat a corn grain, it pops into an airy treat. The same can happen to perlite, which pops into a porous structure of about twenty times its original size. By mixing this perlite through your substrate, the airiness of your substrate is greatly increased. Due to the addition of perlite to the coco, the product reaches an air-percentage of about 30%. The availability of air is essential for the development of roots. Plants require oxygen to ‘burn’ sugars and use them up for their energy. Through the use of this energy, the root system expands and develops further. Kilomix is a high quality substrate, comprised of a mix of different types of high quality peat, perlite and enriched with natural and biological nutrients (like guano, lime and organic fertilizers). These nutrients guarantee an optimal start for your plants for at least 6 weeks. Thanks to its well-balanced composition, this soil ensures for a perfect air/water ratio, whether in dry or humid conditions. Excess water drains easily. Water distribution is balanced in the pot which facilitates plant watering. KILOMIX ensures optimal development of both the root and the upper part of plant material. The plant will show you the difference! Kilomix is a more heavily fertilized soil substrate in comparison with the Janeco-Light-Mix. Kilomix therefore contains everything the plants needs and the chance of shortages is almost nil. Because the right proportions of the fertilizers have been determined in a professional manner, there is a constant supply of important nutrients over a longer period. It is a true pleasure for each plant to be able to develop on such a rich underground! Cocos Substrate is a high quality compost comprised of coco fibres extracted from the mesocarp of the coconut. It is a 100% natural product and designed so that it can be used immediately. The Cocos Substrate contains a basic plant fertilizer. Because of the structure of coco, it can store nutrients that are continually available for the plant. Cocos Substrate is produced under controlled conditions, which is an assurance of quality and offers the ability to use it over and over again after each growing cycle. It can absorb plenty of water in a short period of time and can also deliver water rapidly and abundantly. The roots also have plenty of available oxygen, which keeps them active. Despite the absence of residual water, there is always enough humidity for the plant. Janeco-Light-Mix is suited for a large variety of plants and comprised of different types of peat enriched with perlite. These various types of peat are excellent to support the growth of your plants. Furthermore, characteristics of the peats are reinforced by the addition of perlite. As a matter of fact, perlite improves water distribution and simultaneously increases aeration in the substrate. The aeration is especially important for the root development and increases the uptake of nutrients for a stronger and more resilient plant. This soil is also less inclined to retract and dry out. 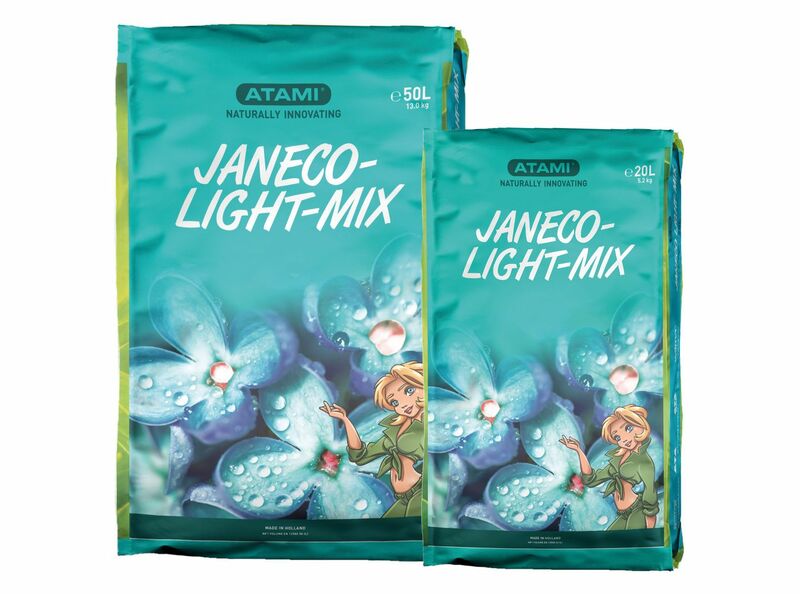 Janeco-Light-Mix contains nutrients lasting for many weeks; it can be used immediately. The peat mix is suitable for a large variety of watering systems and also suitable for seedlings, cuttings and for potting. Bi-Growmix is a high quality substrate. Its composition is well balanced for optimum development of a wide variety of plants. Bi-Growmix is a mix of many types of high quality peat and coco fibres. An important feature of Bi-Growmix is its air/water ratio. The gaps present in Bi-Growmix may be filled with water and air. Thanks to the coco fibres, gaps filled with air take in a higher volume, which means more oxygen benefits for the plant. Bi-Growmix does not retract and easily absorbs water. Nutrients are gradually released and are thus constantly available for the plant. The presence of coco fibres facilitates root development. As far as the amount and ratio of the fertilizers is concerned, this substrate can be considered as medium, between Janeco-Light-Mix (lightly fertilized) and Kilomix (heavily fertilized). Because the Bi-Growmix is pre-fertilized you don’t need to add any nutrients during the first weeks of the cultivation, depending on how many plants and pot size. After this starting period Atami advises to add liquid fertilizer to the nutrient water for optimal results. Bi-Growmix contains coco and peat. The coco ensures an open structure so the roots can grow optimally which is especially important for the uptake of nutrients for a stronger and more resilient plant. Hydro Rokz are made of pure and salt-free baked clay. They contain a very low concentration of elements and this makes them ideal as a substrate for hydroculture. The quality of the clay pebbles is largely determined by the pH value. Clay pebbles are used for various growing methods. Sometimes they are placed at the bottom of the flowerpot when growing on a soil substrate like soil. The Hydro Rokz are also used as an additional drainage. Hydro Rokz can be mixed with the substrate to make the growing medium airier, so the roots can also branch off better. Another method that is widely used, is growing the plants directly on Hydro Rokz. This is often done in combination with an oxygen pump. This way the roots at the bottom of the pot are constantly immersed in water with liquid fertilizers mixed in, and the oxygen pump provides enough oxygen for the roots. Growing hydroponically with Hydro Rokz is very successful, because the clay pebbles and the flowing water nutrient solution are a golden duo when it comes to a lavish supply of oxygen. The plants both get oxygen from the top and from below. The flowing water contains many times more oxygen than ordinary still water. Cocos Slabs is a high quality substrate comprised of coco fibres extracted from the mesocarp of the coconut; consequently, it is a 100% natural product. The Cocos Slabs are designed to be used immediately. The Slabs contain a basic plant fertilizer. The unique structure of the coco ensures it can store nutrients that are continually available for plants. Cocos Slabs is produced under controlled conditions, which is an assurance of quality and offers the ability to use the coco substrate many times over. The fibres can absorb plenty of water in a short period of time and can also deliver water rapidly and abundantly. The roots also have plenty of available oxygen, which keeps them active. Despite the absence of residual water, there is always enough humidity for the plant. Create your own greenhouse in a jiffy! The Wilma Plugs Unit is a natural and environmentally friendly product, especially made of coconut shells. This natural resource is able to recuperate rapidly and is therefore CO2 emission-friendly. Create your own greenhouse in a jiffy! Place the lid on the tray upside down. This creates a mini greenhouse. It provides a favourable environment in which seeds can germinate excellently. Atami B'ounce is a pressed substrate that consists of a mix of coconut, consisting of coconut grit, coconut fiber and coconut kibbles. All ingredients are buffered and rinsed, so Atami B'ounce can be considered as a pure substrate. The ideal surface is reached, because the coconut of the Atami B'ounce is different in structure. The coarser pieces of coconut ensure that the coconut mixture remains sufficiently airy, so more than enough oxygen can reach the roots. The oxygen has a favourable effect on the (rapid) development of a healthy and strong root system. The somewhat coarser pieces of coconut also ensure good drainage. The fine particles of coconut (including the fibers and the grit), on the other hand, act like a kind of sponge and therefore retain the moisture longer, so that enough (nutrient) water remains in the substrate for the plants.